Research says the longer a caller is able to hold a business prospect on the phone, the better his or her chances are in getting a positive result. Okay, research didn’t say that. Common sense says every conversation with a prospect is a chance to establish a connection, build rapport, and eventually, a mutually beneficial relationship. So it follows the longer you keep the person you are calling on the phone, the better the odds of your getting a “yes”. But the million-dollar question is: How do you keep a prospect engaged in a phone conversation outside of singing your best rendition of “Sweet Child of Mine” or telling the person at the other end you might be long-lost siblings? The answer may have something more to do about psychology and sociology than marketing. See, making phone calls goes beyond business. In a way, it is a social act with a social function – the sociology part. Your success or failure hinges as much as in the solution to their problem as it is in your ability to connect with the prospect, to appeal to the emotion – the psychology part. How you marry the two to your advantage is entirely up to you. You probably know the drill: introduce yourself, the name of the company you are calling for, and the purpose of the call. Always do these in a very clear and professional manner. But before going any further and asking the prospect a lot of personal questions, ask if it is a good time for them to spend a couple of minutes listening to your sales pitch. If it’s not, ask when it would be more convenient. Remember to apologize when you make a mistake – like mispronouncing a name or even the address. And of course, always thank the prospective customer for their time. It’s important to show sincere enthusiasm during a phone call to better engage customers on the phone. 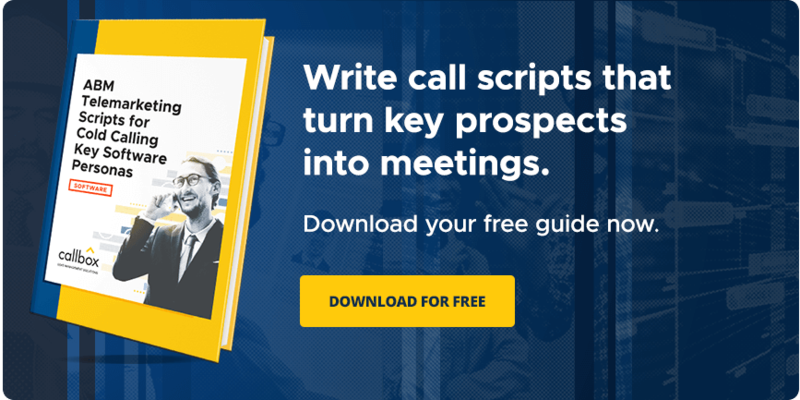 More often than not, you have a company-provided script, but during the critical initial stages – when you’re trying to establish a connection — it’s better to stay off script so that you’d sound more genuine. The person at the other end would appreciate an honest conversation more than one that reeks of aggressiveness and hard selling. If you show genuine interest in your customer, they will feel a stronger connection to you and the company you represent. Giving your customer information that is helpful to their specific situation is a great way to show that you are really interested in their needs. In case the offer is rejected, you can still follow up a call on them after a couple of weeks or months. We’ll never know, it might be the right time to pitch and close the deal. Know when is the right time to call a prospect. Learn more about Smart Calling! You cannot give what you do not have, right? Believe in your product and explain why your product is the solution to the customer’s problem or need. Here’s the tricky part: If the customer is willing to listen to what you have to offer, you can be sure they don’t want to hear you reading it from a catalogue, otherwise, they’ll do it themselves. When you’re pitching a product or service, make sure you know it like the back of your hand and you take to heart whatever you are promoting so you won’t have to use gimmicks just to better engage customers on the phone. You’d not only sound smart and confident, but it will also go a long way in helping to establish credibility for you and your company. Trust is essential to close sales and win loyal customers. Everybody feels good when they hear the words they love to hear. So go ahead, make your customer feel good. Take advantage of certain words that elicit a specific positive effect on a person depending on the situation. Certain persuasive words encourage customers to buy more than others, like: free, guaranteed, new, improved, and instantly. When customers hear these words, it causes some kind of placebo effect — they’ll enjoy their purchases more than they would have otherwise. It’s even better if the quality of the product or service backs up the initial promise. Bonus tips: Five Telemarketing Phrases That You Should Skip! Listening to customers isn’t enough – you really have to listen carefully, paraphrase and repeat their points or concerns. In other words, you really have to have conscious effort in listening to the person you are talking to on the phone. That’s the only way you can respond in an empathetic and understanding way. You should not only listen well during conversations with customers, but also take notes. Your customer will appreciate when you show that you’ve remembered a detail or two about them and bring it up later in a conversation. Using active listening on the phone helps your callers feel heard and appreciated. It makes them more likely to engage with your business and become repeat customers. You can never go wrong giving too much attention and care to your customers! I used to attend a class in college where we were trained to handle phone calls. I forgot most of the lessons except for one: Always smile when talking on the phone. Why? Smiling actually gives your voice a positive, friendly tone. Here’s more: Studies have shown that callers notice when the speaker has a smile on their face and when they do not. Keep a smile on your face when speaking to customers on the phone and you are setting the tone for a positive, engaging interaction that they will not forget. When you’re calling a prospect, don’t ever think that your job is just to get information and close a deal. Think of it as establishing a real connection that would eventually lead to sales. Don’t be a snake oil salesman everyone is avoiding. If you want to better engage customers on the phone, be clear, be genuinely nice, know what you are selling or offering, actively listening, and always smile. Worst case, even if a caller doesn’t have an immediate need for your product or service, they’ll refer your company to friends and family if you engage them well on the phone. Best case, you have a new customer.